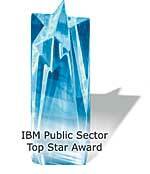 IBM has named Esri a recipient of its 2007 Public Sector Top Star award for consistently demonstrating "best of the best" qualities. Esri was recognized for building success in the marketplace, as well as forging a successful partnership with IBM. "IBM and Esri are committed to improving the health, education, security, and prosperity of citizens and nations around the world," says Pamela Kaplan, vice president, IBM Global Public Sector. For more than 20 years, Esri has worked closely with IBMin the last 15 years providing public-sector solutions across the globe with its latest GIS technology. The companies are working together to deliver GIS solutions to problems in government, health care, education, utilities, and the life sciences. The two companies continue to successfully collaborate on solutions that have been engineered and tested. Esri's fast and powerful Internet mapping and GIS tools, paired with IBM's leading technology and services, provide customers with a suite of spatial management abilities to meet their needs. For more information, contact Pamela Kaplan, vice president, IBM Global Public Sector, IBM (e-mail: pakaplan@us.ibm.com).